"The Napa Valley Mustard Festival Photo Contest has become a "Tradition!" It's one of those events I look forward to all year!" The Wine Country provides spectacular opportunity for fine photography in every Season. From Winter to Spring the yellow Mustard flowers paint the otherwise drab landscape. It is actually a type of weed that grows most everywhere and probably in most countries that grow grapes. Napa Valley has an Annual Mustard Festival Photo Contest. It is hosted by Mumms Champagne Cellars and from December through March, it is time to "chase the mustard". The Theme of this contest is Mustard and Wine, specifically to show off the beauty and ambiance of the Napa Valley during this special time of the year. So each entry must be an image of Mustard and something "Napa". The Napa County line is the perimeter of the shooting range.This rule is somewhat loosely enforced, unless you happen to win. The image had to have been taken within the past three Seasons. The image can not have been submitted for entry to this contest in the past. The images have to be submitted and picked up on the dates posted. There are a few other rules. You can take a look at Napa Valley Mustard Festival. Knowing these few rules will enable you to go out and capture some awesome images for the show! There are main categories and sub categories that enable many choices to strategically place your submissions. I recommend you take a look at previous winners and categories to plan your chances of success. Traditional. This means traditional film developed in a photo lab and chemically printed. Digital. This means any image taken with a digital camera or scanned and digitized and printed digitally. Innovative. This category is for Art, which includes digital paintings, composited images and other artistic media. Napa Valley. This means any image taken within the constraints of the Napa County line. Silverado. This means any image taken along the Silverado Trail. Carneros. This means any image taken within the Napa boundaries of the Carneros Region. The Main Category of Napa Valley has a First, Second, Third Place as well as an Honerable Mention. The Carneros Category has only one Winner! The Silverado Category has only one Winner! For this Year's Winners, go to NVMF and take a look at the Winners! There are various Prizes awarded with each category. This is the reason that I mentioned in the Rules section that if one is savvy, you can enter the category with the best chance of winning. The Napa Valley category has the largest amount of entries. Last year over 400 entries were in this category where only a few dozen entered the Silverado category and a few more than that in the Carneros. In the Digital and Innovative Categories the First Place Winner wins $1000. In the Digital and Innovative Categories the Second Place Winner wins $500. In the Digital and Innovative Categories the Third Place Photo Winner wins a case of Wine. All Winners, including the Honorable Mention Winners, win an entry ticket to the "Photo Finish" worth $125. The Winner of the Carneros Category wins a case of Wine. The Winner of the Silverado Category wins a bottle of Wine from every Winery that poured Wine at the Photo Finish main event! Take a look at this Year's Winners by going to: NVMF. Check out the Winner of the Silverado Category! Yep, its me! Thirty bottles of assorted wine from the wineries that poured at the event! Yes! 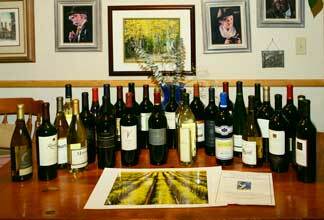 Thirty bottles of Premium Napa Valley Wines as well as an entry ticket to the Photo Finish! The picture on the table is a print of the winning image.